Do you ever daydream about a special dish, something you ate somewhere, sometime? For me, the where and time are hazy but the something is a vivid memory of a clam dish with licorice-flavored cream sauce. I found clams drifting in and out of my thoughts this week. Clams are familiar friends in my galley, requiring little preparation for a tasty bucket of steamers or a fine chowder. Clams with a Garlicky White Wine Caper Sauce add great flavor to a bowl of pasta, and have even topped pizza. Cataplana Clams add chorizo and colorful peppers to the mix. 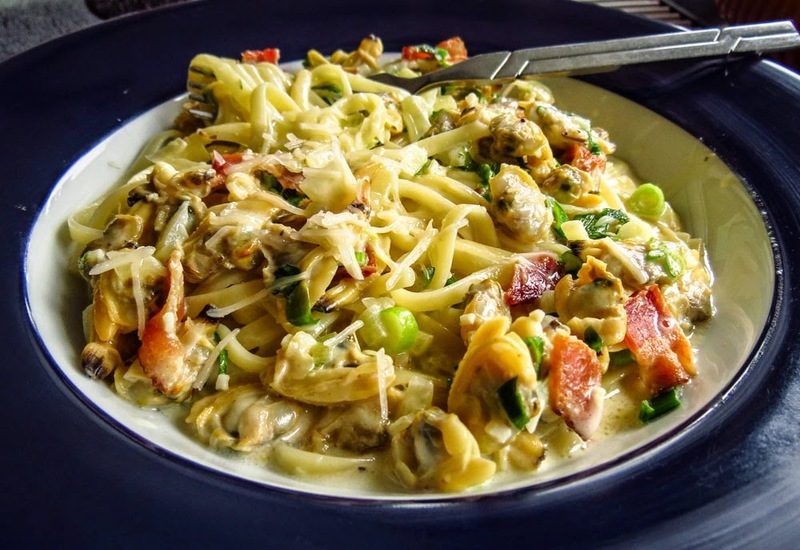 All good recipes, yet my all-time favorite clam dish has been one ordered in a restaurant some time ago, a richly decadent offering of clams bathed in a Pernod-flavored cream sauce. Based on my taste memory of that terrific appetizer (or maybe it was an entrée), plus a little inspiration from a collection of old, clipped recipes stashed in a 3-ring binder on board, I set out to recreate that remarkable dish. When we spend long days traveling, meals are simple, often one pan creations with few ingredients. However when we’re in port for several days at a time, or hang on anchor waiting out stormy weather like our Khutze stay this week (link), it’s fun to spend more time playing in the galley. Ingredients on hand dictate the possibilities, and this week the pantry and fridge offered some fine choices. The prime players in this tasty pasta dish were a large carton of fresh frozen clams, some heavy cream and a new bottle of Pernod. Thick rashers of bacon, green and white onions, fresh garlic, fresh herbs from the garden (thyme, basil, Italian parsley) and shredded Parmesan helped boost the flavor. Wow! I could have tasted my way through the entire pan of sauce all by myself, spoonful by spoonful, without any pasta or maybe even clams. What’s not to like about bacon, cream, Pernod, garlic and fresh herbs?! This recipe was a two-thumbs up winner we will definitely enjoy again. Now I need to work on a healthier version, less guilt inducing yet still full-flavored. Any suggestions? 1. Use a large skillet and cook the bacon until crisp. Remove from the pan and chop. Reserve 2 tablespoons drippings in the pan, plus any crispy bits. In the same pan cook the onion slices until soft. Add the garlic and cook until fragrant. 2. Add Pernod to the pan and over medium heat cook down by half. Add the cream and thyme and cook until slightly thickened, about 8 minutes on my galley stove. Season with salt (optional) and freshly ground pepper to taste. 3. Place the clam meat in the skillet and cook for a few minutes to heat through. 4. Stir in the chopped bacon pieces, fresh herbs, Spring onions. Add cooked fettucine to the pan, stir in another glug or two of Pernod to pop the flavor, and sprinkle with freshly shredded Parmesan cheese. Toss to blend. What’s the story with the plants in the sink? And bare counters? Everything that might move gets stowed safely away before departure, it’s a boat rule when we travel. This really is a safety issue, intended to keep things in place if we start pitching and rolling suddenly. No one wants a coffee pot or cookie jar flying across the galley! 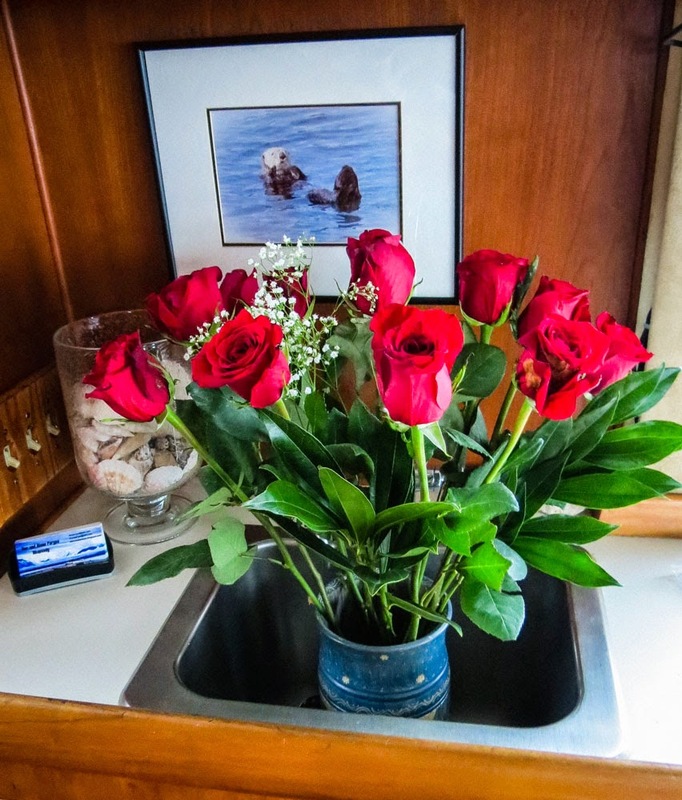 Clear counters prevent messy galley disasters, even if it does look strange to occasionally have plants in the sink. Books occasionally slide around on shelves, but nonskid mats under the bookends and shelves with raised lips help to keep them contained and off the floor. If VHF weather forecasts warn ahead of time that the water will be really lumpy, then we move any tippy things (like table lamps) and heavy items (knife rack, etc) to the floor. Rough seas usually prompt spending another day at anchor or in port instead of heading out into exposed channels. Are there other safety-related boat rules? Of course there are, scads of them, two notebook pages full of specifics to share with onboard guests. Most boat rules are matters of common sense, but it helps crew and visitors alike to review them regularly… before life gets bumpy and exciting. We're off on another saltwater adventure, ready to enjoy the scenery, the wildlife and the people we meet along the way. It will be a while between wi-fi links as we cruise between Campbell River, B.C. and Ketchikan, Alaska. So check back in a week or two to see what's been cooking in the galley. ...and a waffle iron bake-off. What do you enjoy for a leisurely weekend breakfast? Waffles rank high on my list of favorites, and Belgium waffles are irresistible. My trusty, decades old, traditional-style waffle iron has been a worthy stalwart, cranking out hundreds of waffles without fail. The reversible plates no longer reverse, the heat setting knob was lost years ago and the DONE light never lights, but the waffles are still perfect. Perfect, except they aren't Belgium waffles... those other waffles with deep pockets... able to hold tasty puddles pools of butter and syrup. 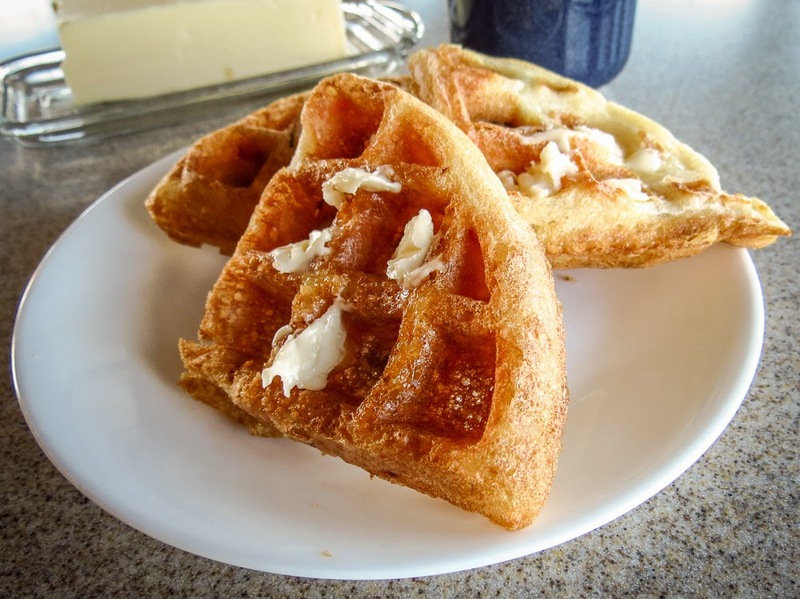 Mmmm, just the thought of a Belgium waffle's crisp exterior, its soft interior, the sourdough tang, can produce hunger pangs and tummy rumbles. Warning; the next few paragraphs are all about waffle irons. If you are looking for a recipe, scroll to the bottom. 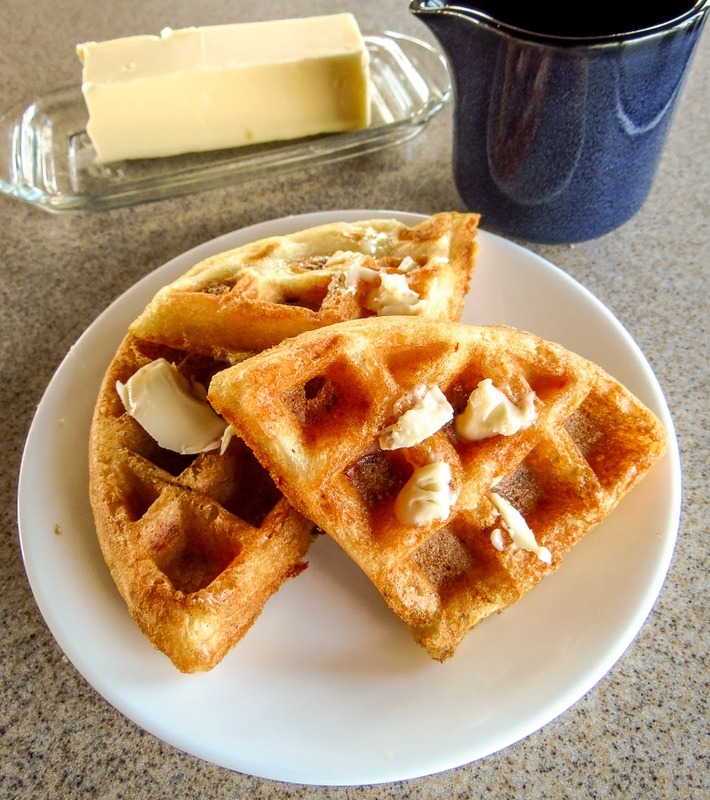 Small, easy-to-store, Belgium waffle makers are readily available, in stores and online. I purchased two different models, one for the house and one for the boat. The Black & Decker purchased for home use was adequate. It was slow to preheat, produced unevenly browned exteriors and had sticking issues. Then it broke. One hinge cracked, the whole thing came apart, and I tossed it out with little regret. An 8"x11" Proctor-Silex acquired for the boat has been a reliable unit, with only a few quirky twists. Waffle tops and bottoms brown unevenly, requiring a quick flip and extra 30 seconds of cooking to brown both sides. There is no heat setting adjustment and the ready-light activates too early, so I need to monitor the steam to gauge progress. 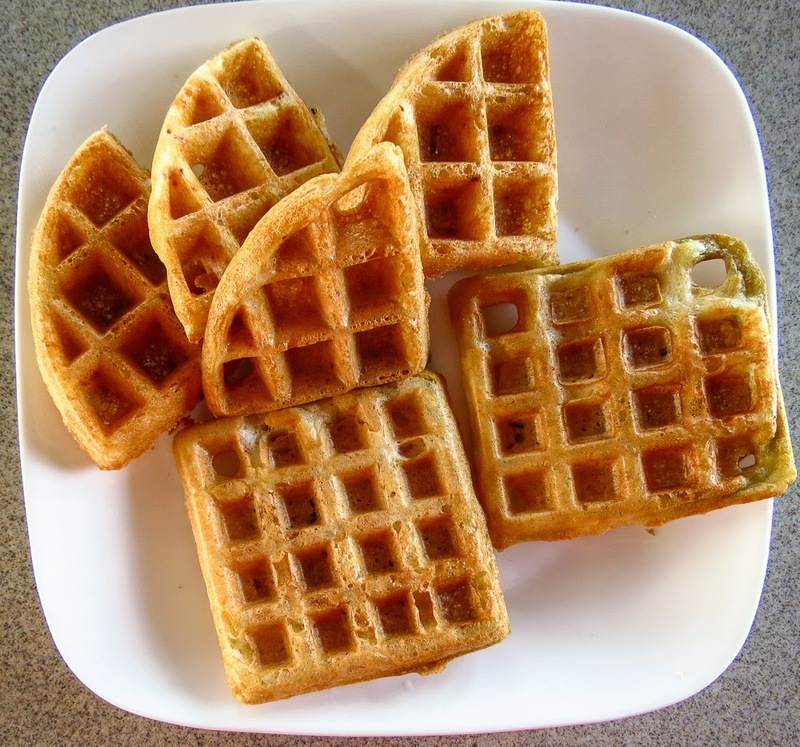 One cup of batter fills the 4 section, round waffle, and the 7.5-inch waffle fills a plate. 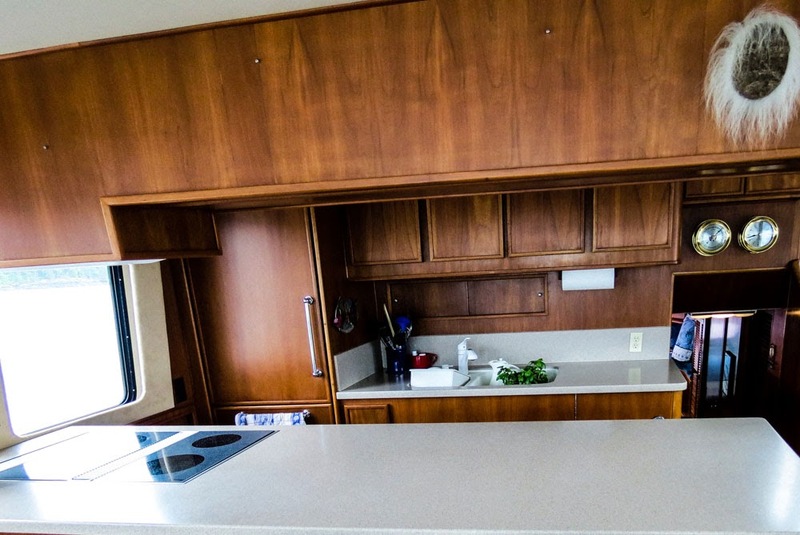 We moved back aboard in a rush this spring, stowing gear quickly to get it out of the way and randomly cleaning and organizing cupboards and cabinets as time allowed. Not the best plan. I mistakenly thought the boat still needed a waffle iron and purchased a small Salton iron. It looked promising and would fit in the cabinet, back in a corner... wait a minute! It fit perfectly - right next to the Proctor-Silex. 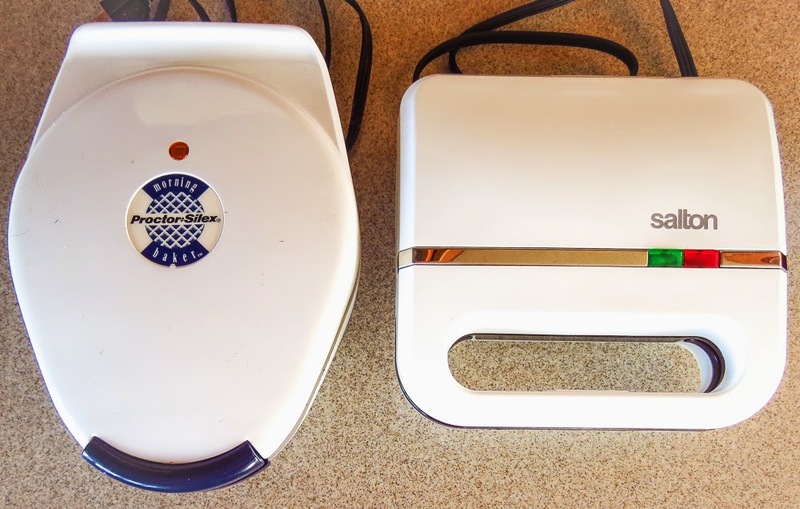 The 9"x9" Salton produces two square 4-inch waffles, each requiring 1/3 cup batter. Like the Proctor-Silex it has no heat setting adjustment and the ready-light activates too early. A waffle bottom will brown and crisp while the top is still quite underdone.The unit produces slightly thinner waffles with shallower holes for the butter and syrup. Storing two waffle irons in a small galley was not preplanned, but the duo will be useful for breakfast gatherings with friends. There will be less wait time for everyone, and the cook will get to dine much earlier. For the two of us, I'll just continue to use the Proctor-Silex, nibbling on one section while I serve the Capt. the other three. We DO prefer those deeper holes; better nooks and crannies to hold the butter, syrup, jam, etc. This recipe makes more waffles than we can eat at one meal, and that's a bonus. They hold well for days in a ziploc bag, stored in the fridge, ready to pop into the toaster for a quick reheat. Who can resist a sourdough waffle for breakfast or as a late-night snack? 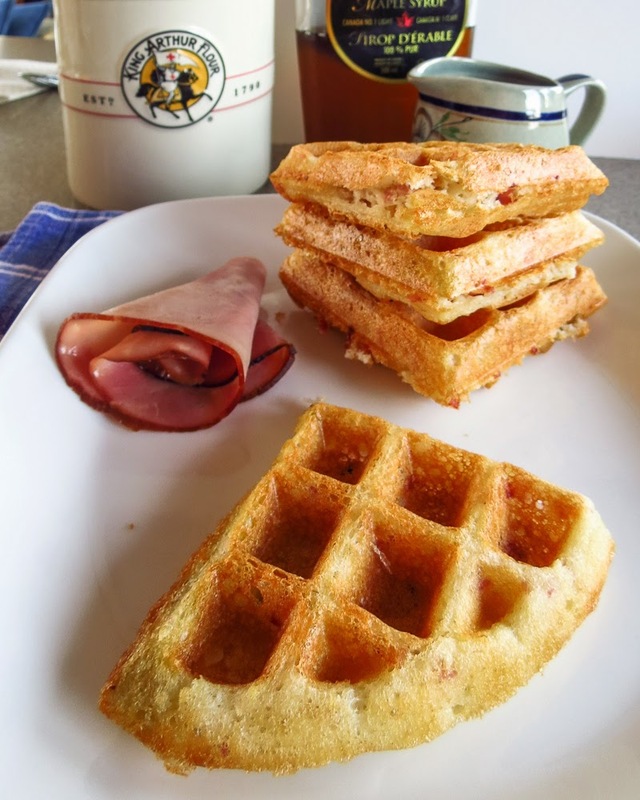 Thin-sliced deli ham and a mild white cheddar add subtle flavor to these already tasty sourdough waffles. Add larger cubes from a chunk of ham and a more assertive cheese for a stronger flavor pop. Toss in some spices, or not. 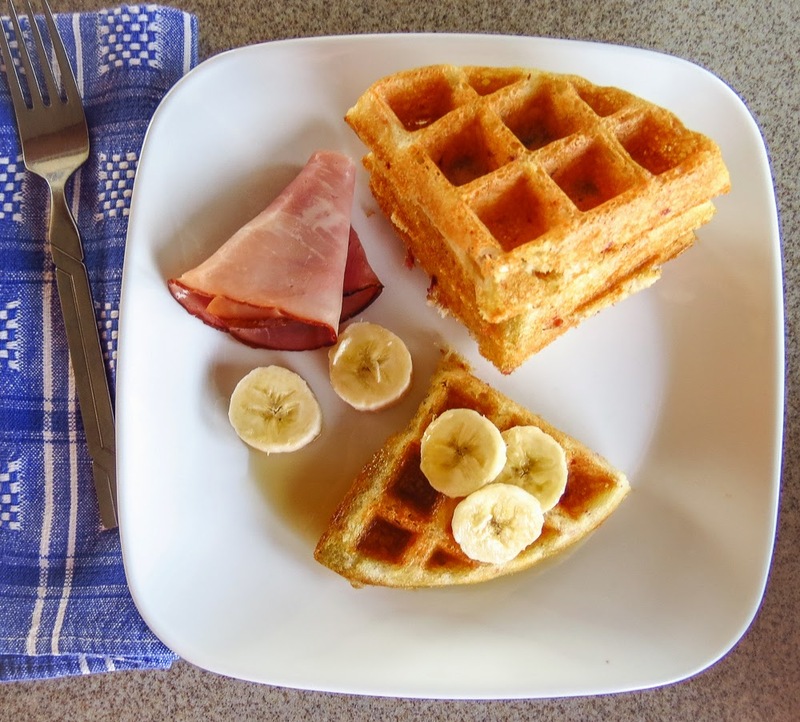 Either way, give Sourdough Ham and Cheese Waffles a try and play around with your favorite toppings. Betcha' can't eat just one. 1.Put the starter in mixing bowl; add sugar, egg and oil or butter. Mix well with wood or plastic spoon. (Some old-timers say sourdough doesn't like metal bowls and utensils) Thin with water as needed for consistency. Add the ham chunks and grated cheese and stir to combine thoroughly. 2.Dilute the soda in warm water. Add the baking soda at the last minute, when you’re almost ready for the batter to hit the iron. Fold the soda water gently into the sourdough batter. Do not beat it in heavily, you want to encourage the bubble formation, not defeat it. The batter will fill with bubbles and increase in bulk. It's ready when it is fluffier. 3.Ladle batter onto a preheated, well-oiled Belgian waffle iron; cover quickly and bake until done. For me that means crispy brown on the outside and soft in the middle. 4.Serve on a hot plate; accompany with butter and warmed syrup or for a more savory taste offer grainy mustard and warm mango chutney. Repeat with the remaining batter. To cook ahead and hold briefly, transfer each freshly make waffle to a wire baking rack and hold in the oven at the lowest temperature possible. This will keep them crisp, resting them directly on a plate will cause the bottom to steam and soften. A Belgian style waffle iron isn’t essential. You can use another style, but we prefer the deeper holes that hold extra butter and syrup. Fresh herbs, yes! They add such a pop of flavor to so many dishes, taking them to the next level. This is an important feature when we cruise and are often weeks between ports and fresh produce. For practical reasons, many tiny groceries in small villages specialize in packaged and frozen items, with fresh anything dependent on weekly ferry delivery or floatplane service. 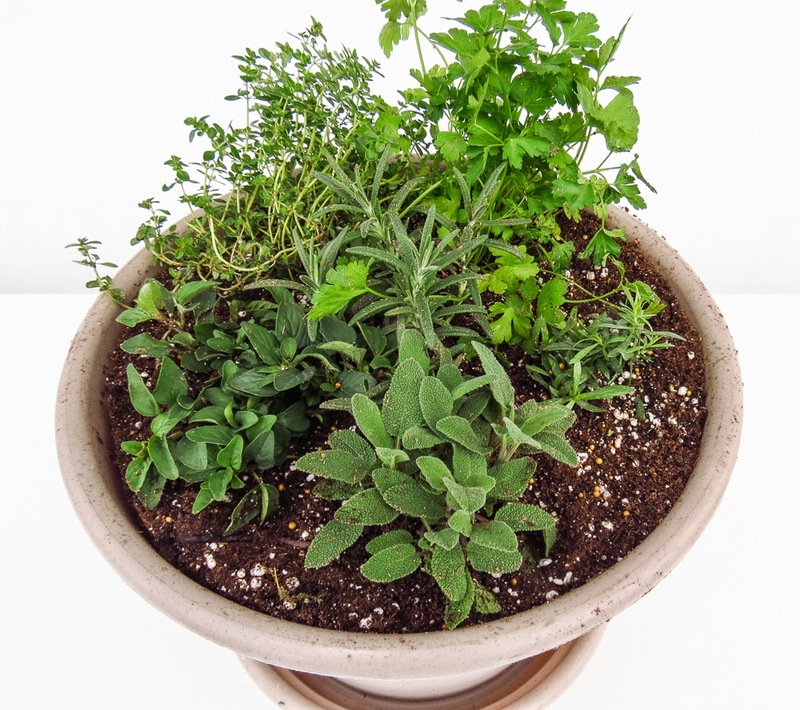 I rely on an herb pot to help me add a sprightly touch to meals on board when fresh produce is limited. Beth, at Campbell River Garden Center, built this year's herb pot for the boat. Each Spring I look forward to visiting this nursery for my herbs, as well as to admire the displays and acres of gorgeous plants. The friendly, helpful staff always finds time to share information, answer questions, and offer a little garden therapy advice. Today they restrained me from stuffing too many herbs into one pot. Included are sage, oregano, thyme, Italian parsley, rosemary and some licorice-tasting tarragon. 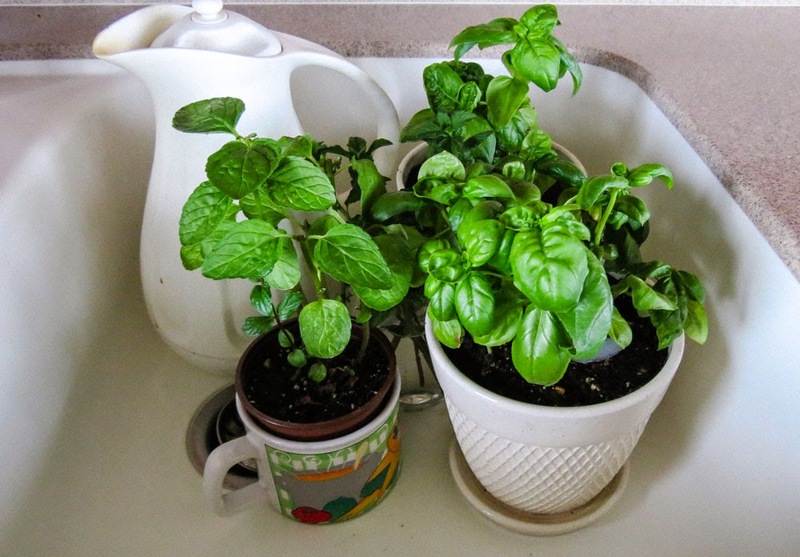 Taking a lesson from previous experience, spearmint and basil plants rate their own pots. Mint is super aggressive and will take over any space available, crowding out its companions. Basil requires warmth and shelter from wind and salt spray, so it becomes an indoor galley plant. 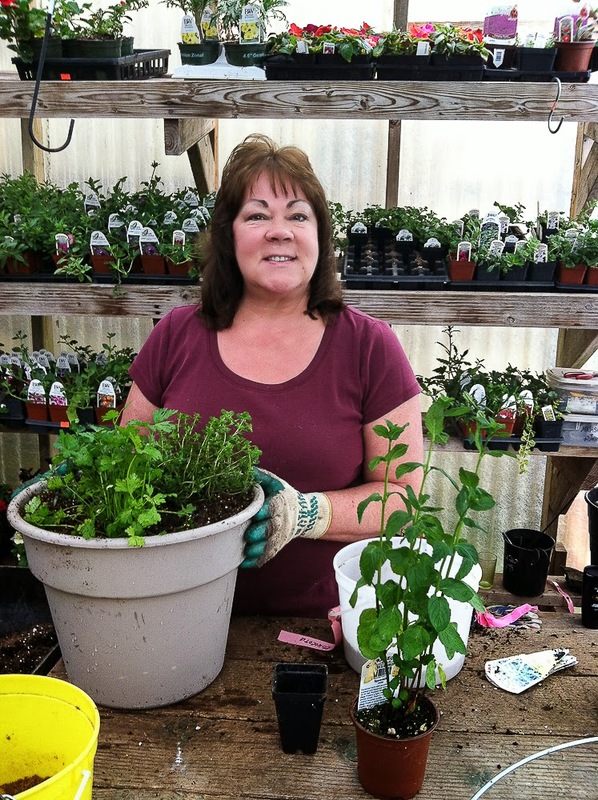 What are your favorite fresh culinary herbs? What do you do with bananas that are overly ripe? You know, the ones spotted with freckles that are too soft to enjoy solo. Do you make banana bread? or peel and freeze them to use in a morning smoothie? Well stop the presses, here's another idea to consider. 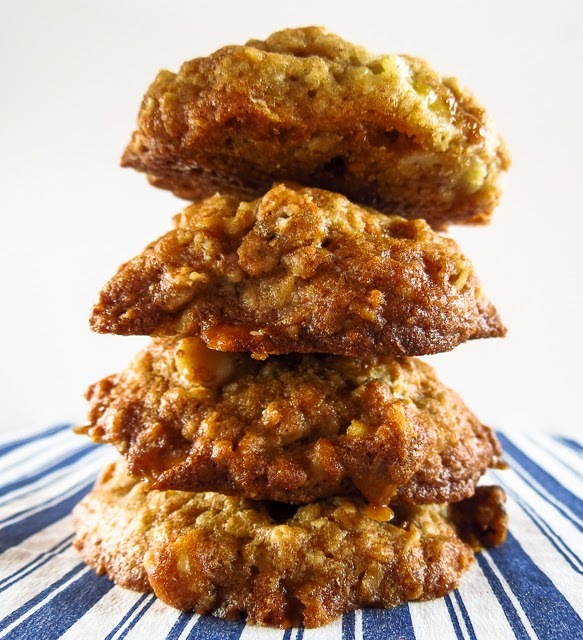 Bake some banana bread cookies. 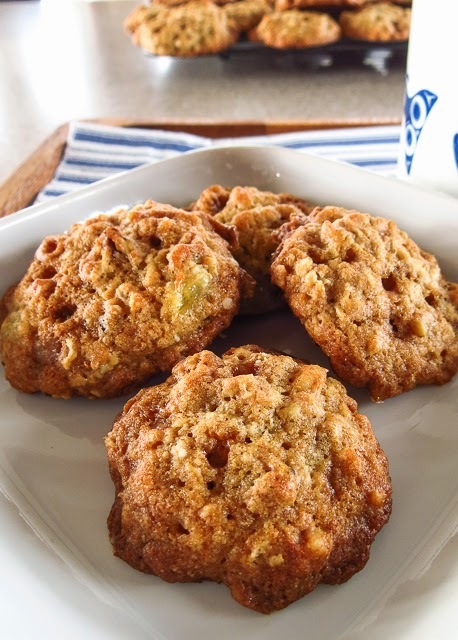 These chunky little treats are soft cookies that mimic the taste of a really good banana bread. 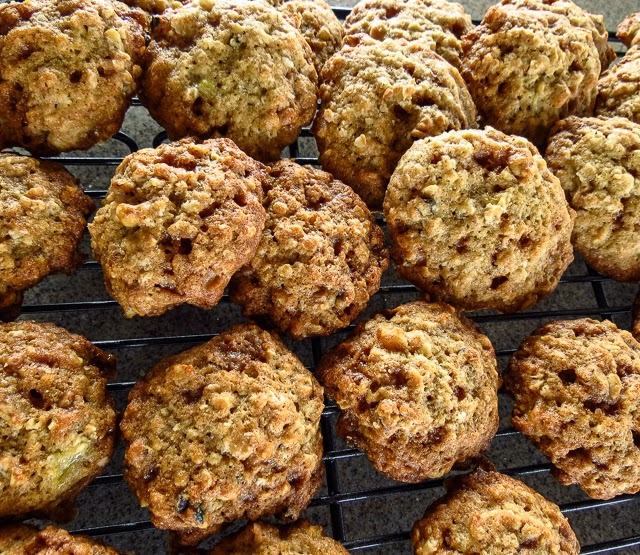 An old recipe for banana chocolate chip cookies was my starting point, but crunchy toffee & nut Skor Chipits seemed a better textural match for the soft, mashed banana than any melted chocolate could be. Hmmmm, I had my doubts when the first cookies came out of the oven. They looked like lumpy chocolate chip imitations, though the galley was filled with the tantalizing aroma of banana bread. Just one bite banished any lingering concerns about appearance; these cookies were tasty. The original online recipe stated the cookies can be stored in airtight containers up to 2 days. What?! there is no way we're going to eat 3 dozen cookies in 2 days, so I'll test this statement and report back. Update: on day 3 the cookies had dried some, their middles now chewy instead of fluffy, making them seem even more like banana bread. 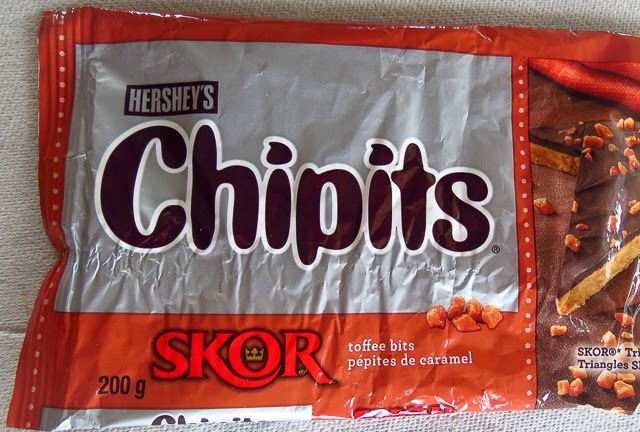 I enjoy chewy and crispy cookies, but time added a heavier, more dense factor to the texture that was not an improvement. Martha had it right, eat within two days or plan to freeze the excess. Preheat the oven to 375 degrees F. Line your baking sheets with parchment paper or silpats. In a small bowl sift together the flours, salt and baking soda. Set aside. In a larger bowl mix together the butter and sugars until light and fluffy (a stand mixer makes this step easy). Add the egg and extracts and mix at low speed until thoroughly combined. Add the mashed banana and mix to incorporate. Add the flour mixture and mix until just combined and the flour disappears. Add the rolled oats, toffee pieces and nuts. Bake on the middle rack of a 375 preheated oven for approximately 12 minutes, rotating the sheets once, until golden brown and just firming up. Use a wide wire spatula to move the cookies from baking sheet to wire baking racks. Let the cookies cool completely before stacking or storing.